Stephen Hawking, the famed theoretical physicist who defied a diagnosis of amyotrophic lateral sclerosis to live virtually his entire adult life with the disease – in a wheelchair and paralyzed but making constant contributions to a world few could understand – has died at age 76, a family spokesman said. Although Hawking may have been incapacitated physically, he managed to write books, including the best seller "A Brief History of Time," teach physics and mathematics, deliver speeches and even float in zero gravity, all while working in the fields of cosmology and quantum gravity. He was not modest about what he wanted to do. "My goal is simple," he once said. "It is a complete understanding of the universe, why it is as it is and why it exists at all." "My goal is simple. It is a complete understanding of the universe, why it is as it is, and why it exists at all." Hawking reached his eighth decade, but was forced to miss a scientific debate to mark his 70th birthday in January 2012 because he was discharged from a hospital only two days earlier. His personal assistant told the Daily Telegraph at the time his speech was getting noticeably slower, sometimes only a word a minute. As part of the events surrounding his birthday, Hawking gave a rare interview to New Scientist magazine and declared there was still one puzzle left for him. Asked what he thought about most during the day, Hawking replied, "Women. They are a complete mystery." In earlier interviews, Hawking was frank about his physical restrictions. "I&apos;m sure my disability has a bearing on why I&apos;m well known," he said in an interview with the BBC. "People are fascinated by the contrast between my very limited physical powers, and the vast nature of the universe I deal with. "I&apos;m the archetype of a disabled genius, or should I say a physically challenged genius, to be politically correct. At least I&apos;m obviously physically challenged. Whether I&apos;m a genius is more open to doubt." Hawking was married and divorced twice. His first wife, Jane Wilde, was a fellow student at Cambridge to whom he was married for 28 years. He then married his nurse, Elaine Mason, whom he was with for 11 years before they separated. He is survived by three children from his first marriage, Robert, Timothy and Lucy. Stephen Hawking with Nelson Mandela in an undated photo. Stephen William Hawking was born Jan. 8, 1942, in Oxford, England. He had two younger sisters and an adopted brother. Hawking developed an early interest in science and mathematics, and when he was old enough his father, a medical researcher, encouraged him to apply to Oxford. While there, Hawking began his studies in physics, and developed an interest in thermodynamics, relativity, and quantum mechanics. 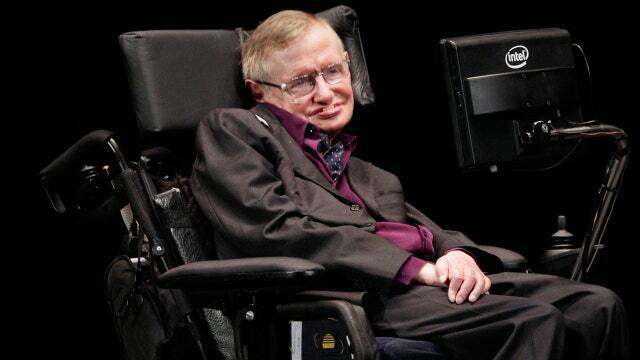 After graduating from Oxford, Hawking studied at Cambridge, where he was diagnosed with ALS. Also known as Lou Gehrig&apos;s Disease, ALS is a fatal, motor neuron disease that causes progressive muscle weakness and atrophy. Stephen Hawking with Pope Benedict XVI. He later said the diagnosis prompted recurring dreams in which he would sacrifice his own life to save others. "After all, if I were going to die anyway, it might as well do some good," he said. "But I didn&apos;t die. In fact, although there was a cloud hanging over my future, I found, to my surprise, that I was enjoying life in the present more than before." Shortly after earning his PhD, Hawking became a professor at Cambridge, working as a research fellow then a professorial fellow before becoming the Lucasian Professor of Mathematics. That same position, which he held from 1979 to 2009, was held by Isaac Newton in 1669. Hawking was awarded 12 honorary degrees and was elected one of the youngest Fellows of the Royal Society in 1974. He was later made a Commander of the Order of the British Empire in 1982 and a Companion of Honor in 1989. He is also a member of the US National Academy of Science and was awarded the Presidential Medal of Freedom in 2009. Hawking&apos;s research focused on cosmology and the basic laws of the universe. Along with Roger Pemrose, he applied a new model to Einstein&apos;s General Theory of Relativity. The model showed that space and time are infinite, and they would begin with the Big Bang and end with black holes. He also concluded that black holes should emit radiation, and that the universe has no edge or boundary in imaginary time. Hawking was never afraid to voice his opinion, even if it could be considered controversial. Using a mathematical basis, he said he was almost certain that alien life existed in other parts of the universe. "The numbers alone make thinking about aliens perfectly rational," he said. "The real challenge is to work out what aliens might actually be like." Stephen Hawking with Bill Gates. He also took a jab at religion, saying, "I regard the brain as a computer which will stop working when its components fail. There is no heaven or afterlife for broken down computers; that is a fairy story for people afraid of the dark." In 2007, Hawking became the first quadriplegic to float in zero-gravity when he took a flight in a NASA aircraft used to train astronauts. When asked why he was taking the flight, he said, "First of all, I believe that life on Earth is at an ever-increasing risk of being wiped out by a disaster such as sudden nuclear war, a genetically engineered virus, or other dangers. I think the human race has no future if it doesn&apos;t go into space. I therefore want to encourage public interest in space." "I believe that life on Earth is at an ever-increasing risk of being wiped out by a disaster such as sudden nuclear war, a genetically engineered virus, or other dangers. I think the human race has no future if it doesn't go into space." Hawking – or his animated lookalike -- appeared on numerous television shows, including "Star Trek: The Next Generation," "The Simpsons," "Family Guy," "The Big Bang Theory," and "Dilbert." In some instances he appeared as himself, while in others animated characters were created to resemble him. A 2014 biopic, “The Theory of Everything,” examined the courtship, marriage and eventual separation of Hawking and his first wife, Jane. The movie, which was directed by James Marsh, starred British actor Eddie Redmayne as the famous physicist. In order to communicate, Hawking used a computer system attached to his wheelchair. He used a switch to select words printed on a screen, and as he formed sentences they were sent to a speech synthesizer. His accent was described as Scandinavian, American, or Scottish. Hawking began using the voice synthesizer in 1985, when he contracted pneumonia and had an emergency tracheotomy.